"The events and phenomena associated with UFOs and aliens are well-trodden territory for high-interest nonfiction, but Kelly Milner Halls puts them into clear perspective in Alien Investigation: Searching for the Truth about UFOs and Aliens (Lerner, 2012; Gr 3-6). Halls interviews experts and eyewitnesses, scouts old newspaper accounts, and reads formerly suppressed government documents. Her balanced presentation of multiple resources and theories invites kids to explore further before coming to their own conclusions." So does the Seattle Times! Yay! "Little green men are always a hit, and Spokane author Kelly Milner Halls (“Tales of the Cryptids,” “In Search of Sasquatch”) knows how to balance curiosity with skepticism in her fiction/nonfiction hybrid, “Alien Investigation: Searching for the Truth about UFOs and Aliens” (Millbrook Press, 64 pp., $20.95, ages 9-12). The first chapter starts with a UFO sighting near Mineral, Wash., in 1947, and includes other reports of odd aircraft, lights, crash debris and aliens. Halls includes official explanations but notes that, in some cases, “the truth is uncertain.” Interviews, photographs, source notes and an incident map will help wannabe Mulders." "You can always count on Kelly Milner Halls to be interesting. It’s not by accident that her website dubs itself Wonders of Weird. The woman is good at creating the kinds of books I would have dived into headfirst as a kid. Whether it’s Tales of the Cryptids, In Search of Sasquatch or her newest, Alien Investigation, she puts the time into her nonfiction titles, no matter how out there they might be. In this latest she’s interviewed experts and presents a book that contains all the different ways of looking at alien encounters. The idea is to leave it up to the reader to decide for themselves. FYI: She apparently does school visits. Man, can you think of any cooler topic from an author at a school than bigfoot or aliens? Fingers crossed that she does ghosts next. Failing that, spontaneous human combustion." "Halls takes a three-pronged approach to the perennially fascinating topic of UFOs, with looks at famous (and not-so-famous) incidents of sightings, landings, and alien bodies; interviews with people who are convinced they have had alien encounters; and a fictional story about aliens visiting earth (with trepidation, the way astronauts might visit Mars). The latter, illustrated with neon-colored, computer-generated artwork, probably could have been eliminated. But the rest of the material—with stories of alien visits since 1947 from all parts of the world and interviews with experts and ordinary citizens—is intriguing and presented in a way sure to capture kids’ imaginations. The organization is a bit lacking, but all the important points about UFOs are covered (including hoaxes), and the lively format, with plenty of art and graphic elements, will hold attention. Several times, Halls invites readers to come to their own conclusions, and she provides plenty of information to let them do just that. A glossary and source notes are appended." "This is a fabulously fun look into the possibility of alien life in the universe and on Earth. " "Children often find stories about aliens and spaceships fascinating and interesting. They typically have lots of questions too. To find a book that provides children a mixture of facts, pieces of information from the news, and interviews all in an easy to understand format is not easy. Kelly Milner Halls has provided just such a book. The book is divided into four chapters that looks at UFO's or space ship sightings over the years. This is followed by a chapter on Crashes and Landings. Next up is a section on Aliens, and it is followed by Hoaxes and Misunderstandings. Throughout the book, children are cued in by the term Imagine and a team of bold alien explorers provide a view point of the aliens preparing to travel. The book concludes with the question "Real or Unreal?" Though the book has only 64 pages, it is filled with a significant amount of text and information. I sometimes find that teachers might consider a book of this length as not long enough for use for a report. However, in reading through this book, Milner Hall has managed to do an admirable job of condensing extensive amount of research into a form that children will find accessible. Additionally, the book does not lean in one direction or the other. It allows the reader to form their own conclusions and to explore further the possibility that life exists beyond earth. After reading through this book, I would recommend it for any school or classroom library." "As someone who watched a lot of X-Files growing up (and last summer, when I re-watched the series), I'm really excited to see books like this for a middle grade audience. It's a great age, where kids are thinking critically but also open to exploring fantastical concepts. Alien Investigation summarizes a lot of the historical evidence and reports about UFOs and aliens. The question is not 'will this book convince skeptics about the existence of UFOs?' (Would any book convince skeptics about the existence of UFOs?) Instead, a better question is 'what kind of information will readers find in this book, and how valid is it?' Intensely researched and brimming with eyewitness accounts, news reports, and expert opinions, this book presents a lot of information in an accessible way that can spark or flame an interest in the supernatural. It's a great addition to any library's non-fiction section." Kelly Milner Halls has written an accessible non-fiction text which delicately balances speculation, research, anecdote, and cultural reference. ALIEN INVESTIGATION has plenty of "what-if" factor that will invite younger readers to consider thoughtfully the possibilities of spacecraft and life on other planets. Halls gently invites the reader to visit the book and to consider these possibilities making no claim for any of the inclusions in the book to be "true." As a multimodal text, ALIEN INVESTIGATION is pleasing to the eye with its deep blacks and mysterious greens. Some pages look like File Tabs wherein Halls, an expert researcher and careful reporter, digs deeper into the subject by calling up scientists, military officials, screenplay writers, even a Kentucky librarian with an anecdotal account of a childhood experience. In fewer than 70 pages, Halls is able to break down sightings over a continuum of 60 year, offering sites and scenarios. Further, Halls offers the types of spacecraft reported and how they have been credited or seemingly discredited by larger governing bodies. Interwoven into the text is the story of an alien who boards a ship with a crew and makes his way to earth, a gentle suggestion that how we receive the idea of life on other planets is indicated by how we treat the very subject in our everyday conversations. ALIEN INVESTIGATION will be an immediate hit with younger boy readers already interested in space and aliens. Halls, like Loree Griffin Burns and Tanya Lee Stone, are leading the way as authors ready to be included in the new focus on non-fiction standards in the ELA classroom. Halls has already made herself welcome with a number of engaging titles. ALIEN INVESTIGATION is another "can't-miss" for Halls, an author who should be celebrated for her dedication to process and her attention to the needs of younger non-fiction readers. Kelly Milner Halls' Alien investigation : Searching for the Truth about UFOs and Aliens allows that there are people who believe [unconditionally] in life on other planets and Unidentified Flying Objects (UFOs), and people who do not, and then sets out to look at existing evidence, providing a very balanced view of the subject for readers on either side of the issue. Among chapters that include dozens of examples of described sightings and encounters are interviews with credible sources that provide readers with information that could add to these debates, such as physicist Stanton Friedman, who believes in the likelihood of long-distance space travel, and government black programs expert Michael Scraft, who would write off many UFO sightings as having been classified tests of advanced military crafts. The design of the book allows for pictures that illustrate the subject, whether the 'ball lightning' that has been confused for an alien spaceship, or archival photos of places where aliens were seen and the people who saw them. Another clever design feature is the report tab that denotes the interview pages. The end matter is as thorough as Halls' other books, and includes a glossary, source notes, sources, a bibliography, photo acknowledgements and a list of UFO organizations and festivals for readers interested in the subject. The even-handedness of the subject makes this a book that will find a home in any library, and one that is a natural draw for reluctant readers. Mention either one and you’ve got the attention of many a boy reader and more than a few of the girls as well and author Kelly Milner Halls has served up a great read for grade school readers interested in exploring this topic. Halls has divided her text into chapters on the space craft themselves, crashes and landings, what the aliens look like and hoaxes of various kinds. Not surprisingly, Roswell takes up a healthy amount of space but there was also information on much more recent sightings in places like Rendlesham Forest, UK (1980), Needles, CA (2008) and Ruwa, Zimbabwe (1994). Young readers will probably find the account at Ruwa most interesting as the witnesses were not military personal like in Rendlesham Forest but a group of school children. The text is illustrated with some photos, children’s drawings and a variety of artist’s renderings. There are also interviews with a variety of experts ranging from eye witnesses to aerospace engineers. My favorite quote? ”A person couldn’t fly from New York, New York to San Francisco, California in 1900 because the technology for flight hadn’t been developed, not because (it was against) the laws of physics.” Stanton Friedman, physicist. What’s missing? Halls has left out the mention of alien abductions, but this makes perfect sense given that the books’ intended audience is as young as 10 years-old. Halls wants to educate young readers on this topic and leave them curious, not frightened. There is definitely enough information here to lead young readers to continue exploring this curious topic. 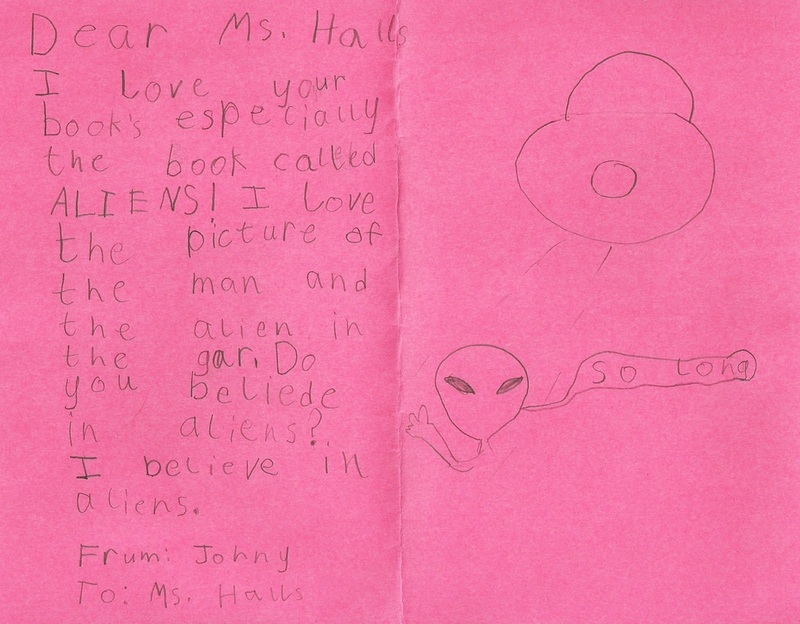 Children often find stories about aliens and spaceships fascinating and interesting. They typically have lots of questions too. To find a book that provides children a mixture of facts, pieces of information from the news, and interviews all in an easy to understand format is not easy. Kelly Milner Halls has provided just such a book. The book is divided into four chapters that looks at UFO's or space ship sightings over the years. This is followed by a chapter on Crashes and Landings. Next up is a section on Aliens, and it is followed by Hoaxes and Misunderstandings. Throughout the book, children are cued in by the term Imagine and a team of bold alien explorers provide a view point of the aliens preparing to travel. The book concludes with the question "Real or Unreal?" Though the book has only 64 pages, it is filled with a significant amount of text and information. I sometimes find that teachers might consider a book of this length as not long enough for use for a report. However, in reading through this book, Milner Halls has managed to do an admirable job of condensing extensive amount of research into a form that children will find accessible. Additionally, the book does not lean in one direction or the other. It allows the reader to form their own conclusions and to explore further the possibility that life exists beyond earth. What did aircraft equipment show when pilots encountered UFOs? What did Major Marcel notice about the some of the debris he collected at the supposed crash site in Rosewell, NM? It returned to its original shape after being crumpled. It was ice cold even after lying in the sun.